I was so moved by this column by NFL All-Pro wide receiver Brandon Marshall, that I wanted to share it with you. He speaks very frankly and eloquently about his own personal struggles, as well as how media reports too often incorrectly link violent behavior with mental illness when we know that just the opposite is true. A gunman bursts into a classroom – or a movie theater, or a community center – and begins shooting. Victims are rushed to the hospital, some to the morgue. We know the scenario all too well. Media and politicians alike immediately condemn the gunman’s actions. And just as automatically, the actions are attributed to mental illness. Whether they occur in a private setting such as Roseburg, Oregon, or on live television as a few weeks ago near Roanoke, Virginia, these high-profile acts of violence provoke outrage and confusion. Why? we ask. What sane person would do this? We struggle to understand, to comfort ourselves with an obvious explanation. So we point to mental illness. Except in most cases, it’s not true. Between 2001-10, there were close to 120,000 gun-related homicides. The facts surrounding these tragedies are clear: mental illness is not the cause. According to the National Institute of Mental Health, only about 4 percent of violence in the U.S. can be attributed to people with a mental disorder. In a recent study, the American Psychological Association concluded that the vast majority of people who are violent do not suffer from mental illnesses; conversely, the vast majority of people with mental illness are not violent. People with severe conditions – schizophrenia, bipolar disorder, and psychosis – are far more likely to be victims than perpetrators of violent crime. We decry racial profiling and religious stereotyping. What about those with mental illness? The fact is, one-fourth of all U.S. adults, approximately 62 million people, have some type of diagnosable mental illness. This ranges from periodic mood disorders to chronic conditions like schizophrenia and serious anxiety disorders. Common mental illnesses can be successfully treated most of the time, including a 70-80 percent success rate for depression. But most Americans don’t know this. Most don’t know if they personally suffer from a diagnosable illness. The tipping point arrived when I became extremely isolated and depressed. I stopped speaking to my wife and family. As the downward spiral continued, it just felt like the new normal. People told me I needed help. Finally, I went to McLean Hospital near Boston and got evaluated in a supportive environment where I felt people actually understood me. Just getting the diagnosis made me feel 50 percent better. And getting the right treatment plan transformed my life. Why did it take so long to get help? The biggest factor was the stigma surrounding mental illness. I saw how ashamed others felt. This was what motivated me and my wife Michi to launch Project 375, a foundation to raise awareness, erase the stigma, and help people to get diagnosed and treated. Nearly a third of adults say they wouldn’t seek treatment for mental illness because they fear what others may think. According to the Mayo Clinic, this stigma can lead to low self-esteem, bullying, discrimination and decreased opportunities. False beliefs about mental disorders get stoked every time a tragic shooting occurs. We need to stop equating violence with mental illness. The fact is, 88 million people in the U.S. who suffer some kind of condition aren’t shooting up schools or movie theaters. They’re struggling to live normal lives. And when violence does rarely occur, it’s because a system overshadowed by stigma was unable to help those in need. As a society, we may feel safer by believing the threat of violence can be ascribed to one group of people. Like human nature, however, the truth is more complicated. Chronic anger, obsession with revenge, cravings for celebrity… these can all motivate people toward violence. We need to accept that mental illness is a disease – and like any other disease, it needs stronger research, early screening and treatment, especially for young people. We need better recognition of new therapeutic treatments scientifically proven to work. We need more robust education in schools, the enlightened support of news and entertainment media, and the advocacy of high-profile figures, like myself, willing to step forward. Because, as I know from my own life, the hardest step to take is the first. 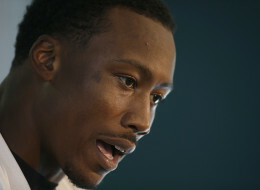 Brandon Marshall is a professional football player and co-founder of Project 375, a national nonprofit that seeks to end the stigma of mental illness. Follow him at @project375, join mycounterpane.com/mentalhealth and subscribe to The Chatter. Thank you for sharing this. I just saw a video on Facebook that basically said people bring on mental illness by thinking negatively and making bad (read sinful) choices. Now, not only are patients dangerous, but it’s their fault because they sin by thinking negatively and refuse to love. I responded at length. I hope it makes a difference.